Me on the farm in Tokyo. I often get asked how to get on a farm in Japan. Farming and food are hot topics right now, and travelers often want to try their hand at getting dirty on a Japanese farm. And with good reason. Farms are often where the the roots of culture and tradition can be found and tasted. There is much to be learned and shared. Yet, travelers need to keep in mind that each farm is unique. Each farmer or farming family has their own techniques and practices, traditions and habits. Keep in mind what your goals as a traveler are (learn a new farming technique, lounge in a hammock after working a couple hours, learn recipes, or get in some language practice, for example) and then keep an open mind and be flexible. There's some good fun to be had out there! 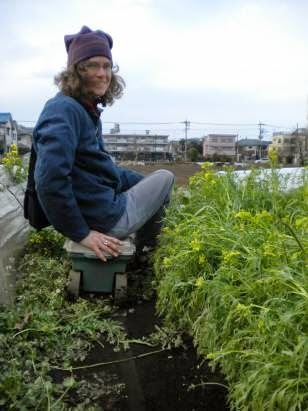 WWOOF Japan – The easiest and best place to look for farming opportunities in Japan is WWOOF. An international organization that pairs those hankering to get on a farm with those who need extra hands, WWOOF is a classic solution. It's not necessarily cheap (6,000 yen or so) for an annual membership, but it does simplify things immensely. We've done it and good friends are currently doing it in Nagano Prefecture. Stays can range anywhere from a week to a month to longer, depending on the farm and farmer and season. If language is an issue at all, this would be the way to go. Farmers markets – If you live in Japan or will be here long term, it might be worth a wander over to a farmers market. Any of them will do, but I might recommend the Earth Day Market as a best option. All organic and all fair-trade, the Earth Day Market is also where the person standing behind the table is the actual farmer. Some speak English but many don't, although that may not be a problem. If you speak some Japanese, no matter how rudimentary, you'll probably do just fine. I might also recommend speaking to the market manager. He or she spends a fair bit of time chatting with the growers, some of whom have been coming to the market for years, about this and that. They might be able to offer a few solid leads on farmers open looking for a bit of help. Again, some speak English, but not everyone. Rural travel companies – If you're looking to spend some time in the country without committing to an extended period of work on a farm, I might suggest a rural travel company. Usually small bi-lingual affairs, these companies offer visitors a chance to spend some time in the countryside exploring by bike or on foot, meeting locals, engaging in cooking or crafting, and generally having fun. We've traveled with One Life Japan a few times and always enjoyed it, and I've got my eye on taking a trip one of these days with Satoyama Experience. Got other ideas or suggestions? Let's hear them.